With OverDrive Read, you can read borrowed ebooks and magazines right in your web browser with a single click. There are no downloads or software required; all you need is a compatible web browser. 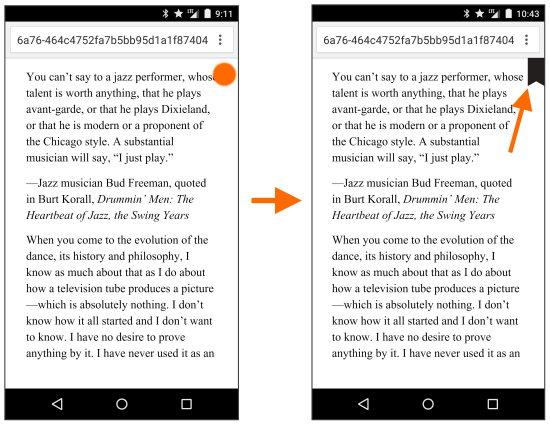 Click or tap the right or left edges of the ebook or magazine to turn the pages. Click or tap and hold a word to define it, make a note, or highlight some text. Click or tap the middle of the screen to bring up the seek bar, which you can use to move backward or forward in the ebook or magazine. You'll also see chapter breaks, bookmarks, and highlights here. On a larger screen, use the display buttons at the top of the screen to switch between a one-page and two-page display. On a tablet or phone in landscape orientation, tap the middle of the screen first, then use the display buttons. You'll find the menu icon in the top-right corner of the reader. Search: Look for a word or phrase in the text. Chapters: Browse the ebook or magazine's table of contents and quickly jump to chapters or sections. Bookmarks: View the bookmarks, notes, and highlights you've placed in the ebook or magazine. Click one to return to that part of the text. 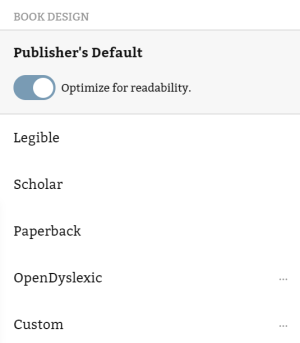 Reading Settings: Adjust the ebook's text size, lighting, and font (available for most ebooks). Offline Access: Download an ebook in your browser so you can read it later without an internet connection. Narration: Start playback or adjust the volume and playback speed. In many OverDrive Read ebooks, you can adjust the reading settings to change how the ebook looks. Note: Reading settings for fixed-layout magazines and ebooks (like graphic novels or picture books) can't be changed, because the publisher decides exactly how each page looks. Learn more about fixed-layout titles here. Text scale: Use the slider to adjust the size of the text in the ebook. Lighting: Choose bright (black text on a white background), sepia (dark red text on a tan background), or dark (white text on a black background). Book design: Choose a preset design you like, or select Custom to change the font, justification, line spacing, and text weight.